Professor of Chemistry Lionel Cheruzel has been tremendously productive in his field of bioinorganic chemistry. 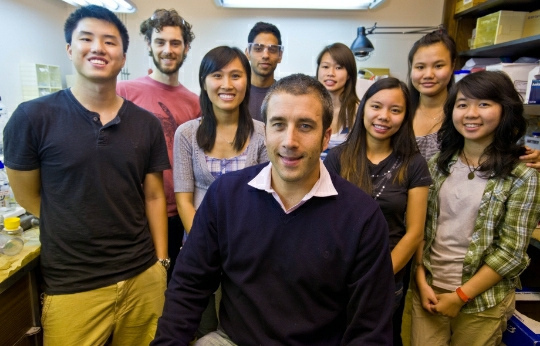 He leads an active research group comprised of eight undergraduate students and one graduate student focused on Cytochrome P450 and the synthetic potential for biotechnological applications (photo courtesy of SJSU Research Foundation). President Mohammad Qayoumi, Provost and Vice President for Academic Affairs Ellen Junn, and Research Foundation Chief Operating Office Mary Sidney cordially invite you to “A Celebration of SJSU Sponsored Research” 3-5 p.m. Oct. 18 in the Student Union’s Barrett Ballroom. Join the entire SJSU community in a celebration of campus-wide research endeavors. Visit research program exhibits. Enjoy presentations by Early Career Investigator Awardees Dr. Lionel Cheruzel (College of Science) and Dr. Lili Luo (College of Applied Sciences and Arts). Wine and hors d’oeuvres will be served.